Kansas City, MO ­ March 4, 2014​­ The Kansas City Food Circle kicks off the growing season with the 17th annual Eat Local and Organic Expos. T​hese events will provide KC with a chance to get to know some of the KCFC Member Farmers who grow their food. 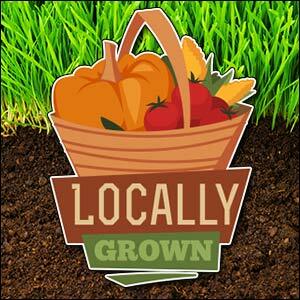 V​isitors can buy local, organic produce; free ­range meat, eggs and dairy; and vegetable seedlings for home gardening. The Expos are also a great place to sign up for Community Supported Agriculture (CSA), where consumers can buy their food directly from farmers. This year’s Expos feature a workshop called ​“Little Sprouts: The Joy and Wonder of Learning How Things Grow.” Dayna McDaniel of SeedSavers­ KC​ welcomes kids of all ages to this introduction to seeds, pollination, fruit production, and seed harvest. K​ids will plant a pot of seeds to grow at home.​ This hands-­on activity reveals the magic of gardening to kids and parents alike. The workshop runs from 10:00 ­10:45 am at both Expos. All visitors receive a free 2​015 KC Food Circle Directory of Farmers​ with detailed information on KCFC Member Farmers and organic farmers markets. P​urchase raffle tickets to win a hearty farm basket with goods from farmers, gift certificates from sponsors, coupons and more. G​uests can also join the KC Food Circle as a member. Membership benefits include invitations and discounts to farm events, food classes, and the 2​015 Eat Local & Organic Dining Card​ which provides a one ­time 10% discount at 15 area restaurants. Two food trucks ­ Plantain District and Wilma’s Good Food ­will be in the parking lot ready to serve up some delicious local food. “The Expos are a breath of fresh air after our dismal midwestern winter; I stock up on the fresh greens I’ve been missing and I grab up some more plants for my garden. I also love getting the chance to talk to my farmers in person who work so hard to feed my family healthy, delicious food," said Michelle Cohen, health coach. Sponsors of this year’s Expo are Local Pig Charcuterie, Howard’s Organic Fare and Vegetable Patch, The Sundry, Seed­Savers KC, Missouri Organic, Homestead Hill Farm and Nursery, Greenability, KC Gardener, Door to Door Organics, Fertrell, Slow Food Kansas City, Wood + Salt, and Sierra Club. Services are provided by Precision Printing. Graphic design is provided by Joshua Fultz and Rachel Allen. Connecting Kansas City with local, organic, and free­range food farmers for more than 20 years. Contact: Emily Akins e​mily@kcfoodcircle.org Visit w​ww.kcfoodcircle.org​ for more event details.